My wife and I were staying in East Glacier, finishing our vacation the next day so we decided on one more hike on June 28. Going to the Sun Road was still closed but we knew that at the point where drivers would no longer be able to continue there was a trail head for the Avalanche Lake hike. So we drove up to this popular area and at 1:00 p.m. we started up the trail for the 2.1 mile hike to the lake. We had been told that there were two black bears feeding up at the lake, but knowing that we would not be close to these bears, I never even considered bringing a telephoto lens with me as I was interested in the big landscape pictures that this trip had already afforded me. Upon arrival Avalanche Lake, after the easy hike, we spent around 20 minutes taking in the sites and in watching the black bears feeding on the other side of the lake. Then we proceeded back down the trail. Fortunately we were not alone as a number of other hikers were directly behind us. About 3/4 of a mile out from the lake and while enjoying the day, I looked up the trail and OMG, there were THREE Grizzly bears waltzing towards us on the trail!!! The mother was huge and her two cubs had to be at least a year old. Everyone froze instantly. Were we excited? You bet! This was NOT expected especially on a popular hike in the middle of a very sunny day and in black bear territory, not exactly grizzly territory. We looked around us and realized that we had nowhere to go. You cannot outrun a bear especially grizzlies who are known to run 100 yards in 6 seconds. The trees around us were not exactly climbable as if this group of hikers were tree climbers. The bears, at this point, had stopped approaching us and were lolling around in the middle of the trail. I had read quite a bit about what to do when encountering bears and when asked what we should do, I said, spread out a bit and start screaming at the top of your lungs and wave your arms. By this time the bears had already noticed our presence and had stopped walking towards us. In fact, one of the cubs was rolling on his back in the trail and enjoying the moment while the mother just kept watching us as the picture above clearly shows. Screaming was not a problem as coming up the trail and from behind the bears was another group of hikers who, if not stopped, would probably have surprised the bears and would have been closer to the cubs. That would have presented a HUGE problem. So here we are screaming away, the mother bear looks at these crazy people and just as the books had indicated, she moved off of the trail leading her cubs up and around us to the great relief of everyone. Upon finishing the hike I found a ranger as you are supposed to report bear encounters. I told him what had just happened and noticing my large camera, he asked me if I had pictures. Of course, I explained, as the first thing I started to do upon seeing these bears was to click off a few shots while my wife was shouting at me to back off. He looked at the pics, asked me to zoom in on one, realized that these were, in fact, grizzlies and that they were on the path. He next called for bear specialists to come to the area. He explained that they had heard of some grizzlies in the area but the last thing they wanted or needed was having bears hiking on the trails with other hikers. Apparently the grizzly bears would be transported to another area of the park. Bear bells while nice to wear will not alone keep bears at bay. Carry bear spray (pepper spray) with you at all times while hiking in the woods. Sprays have proven to be effective and this was not even our first bear encounter on this trip so carrying bear sprays is a must. Hike in groups. I had read that in many areas in the national parks it was highly recommended to hike in groups of not less than four people. Apparently the larger the group the greater the deterrent. Remember not to panic and run. While thankfully we did not have to do this, I had heard that if a bear does reach you, drop to the ground and play dead. Hiking in the middle of the day in bright sunlight on a heavily populated trail does not ensure that you will not be close to bears. If hiking with very small children, be especially wary and strongly consider not taking the hike if bears were known to be close by. A number of mothers with young children immediately turned around and went back after hearing about our experience. Very small children can present greater risks. This was our third and most exciting bear encounter while in Glacier the last week of June. And it only goes to show that when hiking in the National Parks, you have to be aware of the fact that you may encounter bears at any time and that you should read up on all the advice available to be prepared if these encounters occur. And enjoy Glacier!!! It is fantastic country. 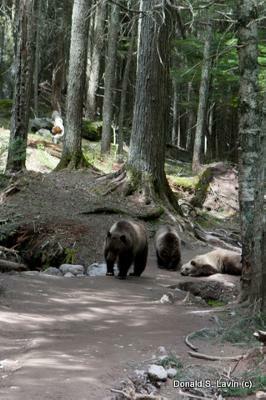 June 2011 we saw a mother and 2 cubs VERY similiar colored (one cub light blonde) to the ones in the Avalanche Lake hike story while we were hiking NW of there to Granite Chalet. My wife would do the same thing. …we were hiking to Grinnell lake from Many Glacier and when we reached Lake Josephine we spotted a light brownish bear near the shore 50 yds away eating berries. The bear was next to the trail. Then a hiker approached on the trail. We waved and shouted to get his attention but he did not hear us. The bear hid low behind a bush 10 to 15 feet from the hiker, who did not notice the bear. After the hiker passed by, the bear calmly resumed feeding. The trail was busy with hikers, and whenever hikers approached from either direction, the bear hid low behind the bush. The bear was never detected.We had to walk down the same trail and I told everyone to walk and talk normally but do not stop or look at the bear. We saw nothing and continued on our way. by: pocketlintI’ve done that hike numerous times.Why did the author believe that Avalanche Creek was black bear territory? Grizzly bears are the apex predator in this part of the world…and as such, grizzly bears roam wherever they feel like roaming…including Avalanche Creek. Grizzly bear and black bear territories overlap…no way around that fact. However, it’s also obvious that these two bear species have worked out a way(s) to coexist in the same environment/habitat. It’s a good article overall though and I enjoyed the story and picture. Re. #1: Bear bells are useless. They can’t be heard far enough away to give the bears any warning that you are approaching. I’ve been within 15 feet of hikers wearing bells and didn’t hear them. That was a great story and I am glad that it ended with a happy ending. I hiked that trail with my family back in 1974, but did not have any bear experiences. Beautiful scenery on that trail. Also, hiked up to Granite Park Chalet from Logan Pass as a day hike, later that year. We were very aware of Grizzly bears on that hike. The book, “Night of the Grizzly” hadn’t been out for very long and was fresh in our minds. Needless to say, we were very relieved to not have a bear encounter on that hike.